Office Hours: 9:00 a.m. until 4:00 p.m.
baptism of your first child. 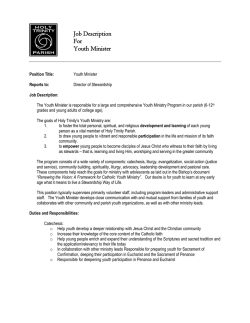 entry into the Catholic Church? 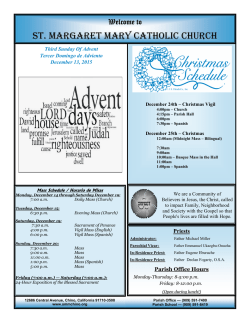 Contact the parish office for an appointment. passports and reservations for the whole family on a new liner to the United States. The entire family was filled with anticipation and excitement about their new life. However, seven days before their departure, the youngest son was bitten by a dog. The doctor sewed up the boy but hung a yellow sheet on the Clarks' front door. Because of the possibility of rabies, they were being quarantined for fourteen days. shed tears of disappointment and cursed both his son and God for their misfortune. for saving their lives and turning what he had felt was a tragedy into a blessing. might deem as a tragedy can sometimes actually be a blessing in disguise. bring your thanks and praise. 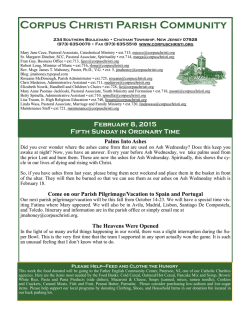 gatherings will be February 15, March 1, and March 15. † Albert Peyronel who died January 29.
resume rehearsals on February 10.
joy seems hard to find. choose despair and be destroyed by it. basket at Mass. 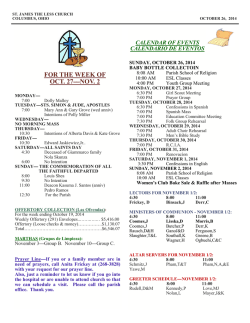 You can also return your choice to the parish office or by calling 724-335-2336. Father Ken or a parish staff member will be happy to answer your questions. Deadline for orders: Monday, March 9. Extra nut rolls will not be sold at Ɵme of pickup. 724-335-2336, or online at www.smmlb.org. Thank you for your order! 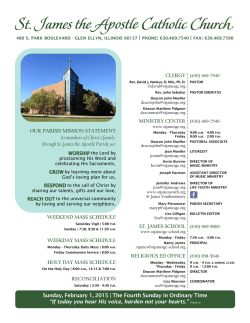 visit www.dioceseofgreensburg.org. The deadline to register is February 15.
at dmisak@smmlb.org or (724) 335-2336.
from 6:30-8:00 p.m. in the Freude Room, facilitated by Kimberly Yakelis, beginning February 11.
facilitated by Arlene Golden, beginning February 17. Cost of 2 study books: $15 due at the first class. To register, contact Arlene at 412-203-1586 or goldenae@mac.com. so that the campaign contributions go directly to the principal of the loan. place your lottery ticket money in the weekly collection and clearly mark it for CD of A Court Vandergrift #1008. 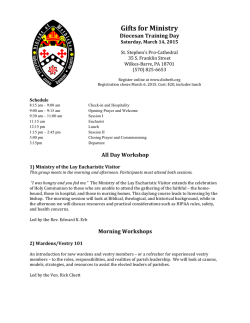 The annual Men’s Retreat at St. Paul's Monastery, located on the south side of Pittsburgh, will be held on March 14 - 15. 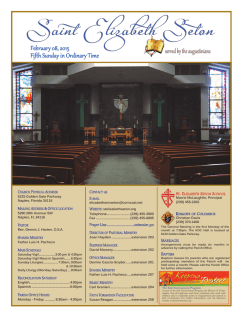 Come and enjoy a weekend of prayer and religious activities with other men from St. Margaret Mary. Call 724-3353569 for details. 6:30 p.m. at the Loafin’ Bakery Café, Lower Burrell, to create, discuss and share ideas, writings, and passions.